AMS Performance is excited to announce the release of their Alpha 991.2 Carrera High Flow Dry Media Filter. Their Engineers designed the Alpha filter to be a direct drop in replacement for the OEM filter. 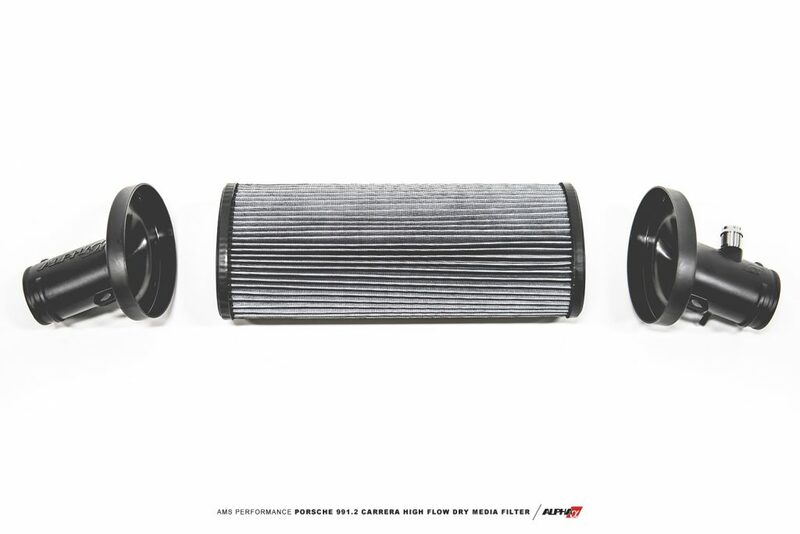 The new dry media filter along with the Alpha 991.2 Carrera Intercooler System work together to bring in a high volume of air and then cool it down giving you the opportunity to make more power as more Alpha upgrades for your vehicle become available. The AMS Engineers designed the 991.2 high flow dry media filter to provide the optimum air flow. The filter is an amazing 6.875 square feet of high flow filter material. Our filter features 55 pleats that are 15.5″ wide and at a depth of .75″ giving it the optimal structure for the best balance of flow and filtration. Perhaps the best feature about this high flow dry media filter is that it improves the effectiveness of your future Alpha Performance upgrades giving you maximum hp output potential. Increasing airflow in and out of your engine will improve turbo spool characteristics and increase power output when tuned accordingly. To further improve airflow, our engineering team went a step further by computer designing precisely molded, custom silicone couplers. These provide perfect fitment and optimized geometry for improved airflow volume and velocity providing horsepower gains and quicker boost response helping you stay ahead of your competition! Perhaps the best feature about this intercooler system is that it maintains cooling efficiency as more power producing upgrades are added to your Porsche Macan! It improves the effectiveness of your other upgrades giving you maximum hp output potential! The AMS filter uses a specially designed media that restores performance and efficiency to near new each time by simply cleaning it with compressed air (30-40 psi) from the inside out. Frequent washing is unnecessary in order to restore filter performance. For a deep cleaning after exposure to extreme environments, a biodegradable cleaner such as Simple Green or other mild shop degreaser can be used. Place the filter in a solution or spray the cleaner on the filter. Allow the solution to loosen dirt particulates and rinse thoroughly. Shake the filter or use compressed air from the inside blowing outward to remove residual water. Allow a full day to dry. At AMS they specialize in automotive performance for Japanese and German turbocharged vehicles. They offer engine computer tuning (calibration), repairs and maintenance and most importantly engine and other driveline modifications. First and foremost AMS is an engineering company. Unlike other shops their parts are engineered to be the best performing you can buy. Most shops in the industry have a basic understanding of engine performance but at AMS we take it far past that using computer aided designs and mechanical engineers with years of motorsports experience. AMS and its sister brand Alpha Performance have been at the top of the game for 15 years. From turn-key packages to individual components we can meet and exceed all kinds of performance goals. From drag racing to road racing to spirited driving on the streets, let AMS enhance your driving experience! The goal of AMS is to provide the highest quality, best performing products available. By utilizing research and development and rigorous testing programs AMS will never compromise the quality or performance of their products. In addition AMS will only provide the finest customer service offering only advice and parts that are in the best interest of the customer. AMS was built on a foundation of integrity. This is who they are. This is what you can count on.